For the estimated 5.5 million Americans living with Alzheimer's dementia, home can be a perilous place. Alzheimer’s can affect a person’s judgement, senses, behavior, and physical ability, which may lead caregivers to become concerned for their loved one’s safety at home. 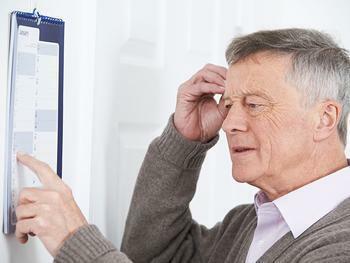 People with Alzheimer’s may forget how to use household appliances, have difficulty understanding instructions, and have physical coordination problems. Moreover, they may have an impaired sense of time and place -- a change that could result in getting lost on their own street. But caregivers can implement a few safety measures at home to make sure their loved one stays safe, even as their abilities change. Here are a few ways caregivers can make home a little safer for those living with Alzheimer’s, according to the Alzheimer’s Association. Evaluate the home. Take a look at your loved one’s home environment to see where safety risks may be present. Pay special attention to areas where there are more likely to be tools, chemicals, cleaning supplies, and items that may require supervision. Consider your loved one’s abilities when determining what changes need to be made. Make the bathroom safer. Consider installing a walk-in shower. To prevent falls, add grab bars to the shower or tub and at the edge of the vanity to allow for safe movement. Add textured stickers to slippery surfaces. Kitchen safety measures. If the person you’re caring for is still cooking, consider installing appliances that have an auto shut-off feature. If your loved one has experienced a change in their sensitivity to temperatures, consider adding a temperature-controlled water faucet. Prepare for emergencies. Keep a list of emergency phone numbers in a prominent place and be sure the home has working fire extinguishers, smoke detectors, and carbon monoxide detectors. Add extra lights. Remove clutter and tripping hazards and keep walkways well-lit. To reduce disorientation, consider adding night lights to hallways, bedrooms, and bathrooms. Safely store dangerous items. Lock up or remove items that may pose a safety hazard. This may include firearms, cleaning supplies, medications, alcohol, matches, and sharp objects. Install locks. If you fear your loved one may wander out of the house, place deadbolts either high or low on exterior doors.